Arms Deal 2 - Here We Go Again? 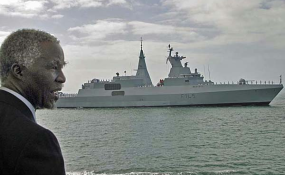 Former President Thabo Mbeki was forced out of office over attempts to prosecute Jacob Zuma, his deputy, over the arms deal, which included the purchase of this German-built naval frigate. Johannesburg — South Africa's most important corruption trial since liberation has ended in a 15-year prison sentence for Schabir Shaik, financial adviser to the country's deputy president, Jacob Zuma. The long prison term adds to the pressure on President Thabo Mbeki -- who soon faces a crucial G8 Heads of Government Summit in Gleneagles, Scotland -- to fire Zuma, the leading contender to succeed him as head of state. Sitting in the Durban High Court, Judge Hillary Squires last week convicted Shaik on two counts of corruption and one of fraud. Today, he said there was no reason he should refrain from imposing the minimum jail term of 15 years laid down in sentencing guidelines. Squires sentenced Shaik to 15 years' on each of the corruption counts and to three years' on the fraud charge, but ruled that the three sentences should run concurrently. Shaik is on bail pending an appeal. Zuma was not on trial and did not give evidence. However, he was central to the judgement. The judge found that payments Shaik made to Zuma had been in return for Zuma's intervention as a public office-bearer in Shaik's business interests. The court rejected evidence from Zuma's lawyer, who said there had been a loan agreement between the two but that it had gone missing. One of the charges against Shaik was for negotiating a bribe agreement with a French armaments company to secure Zuma's protection against a government investigation of the company. Calling for 15-year sentences, the prosecutor said that as deputy president, Zuma was "a heartbeat removed from the highest office in the Republic... Shaik's involvement in corruption at this level could hardly be more serious or damaging to the institutions of government and the interests of the Republic." Shaik's defence counsel, referring to his client's role in South Africa's liberation struggle, urged leniency, saying it was "because of people like him that that we live in a democracy." But the judge said Shaik had "lost his moral compass." Key constituencies in the tripartite alliance between the ruling African National Congress, the SA Communist Party and the Congress of South African Trade Unions (Cosatu), have defended Zuma in the wake of Shaik's conviction. Cosatu, whose general secretary, Zwelinzima Vavi, has suggested Zuma's candidacy for the presidency is an "unstoppable tsunami," says Zuma should not be forced out of the deputy presidency before having the chance to defend himself in court. Pro-Zuma forces charge that the Shaik trial - and the failure to prosecute Zuma - is part of a political conspiracy against their candidate. The judge's background - Hillary Squires was a justice minister and a judge in Ian Smith's Rhodesia - intensifies their attacks. However, Mbeki is under pressure over the next three months to demonstrate his commitment to principles of good governance, one of the foundation stones of the New Partnership for Africa's Development (NEPAD) plan which he and other African leaders have sold to the G8 nations. Only last week, after a White House meeting in Washington DC, Mbeki and President George Bush issued a statement reaffirming "our joint vision for African economic growth and development, a vision built around the principles of good governance and accountability...." Bush was reported as saying that countries such as the United States "are not going to want to give aid to countries that are corrupt, or don't hold true to democratic principles, such as rule of law and transparency and human rights and human decency." Mbeki's influential policy and communications chief, Joel Netshitenzhe, has come out against the feeding frenzy launched by opposition parties baying for Zuma's dismissal. The government would not behave like a "cannibal wanting to eat human flesh," he said. But significantly he also praised the court's judgement. It had "contributed in clarifying many legal and moral issues pertaining to the vexed subject of corruption and abuse of office," he said. And Zuma's camp told the well-connected Business Day newspaper that a statement by Netshitenzhe - that Mbeki would announce any decisions he had taken when he returned from a visit to Chile at the end of the week, and that he had told Zuma this - was in effect an ultimatum to Zuma to resign.